June 17, 2015: Obama’s former senior adviser David Axelrod says he would have made an inquiry if he knew Clinton was using a private server. August 8, 2015 and Shortly Thereafter: The company that manages Clinton’s server gives a presentation to Congressional investigators but fails to mention the deletion and wiping of Clinton’s emails. However, it seems apparent that PRN says nothing about the later-revealed fact that PRN employee Paul Combetta deleted and wiped all of Clinton’s emails off her server in late March 2015, because Johnson will show no knowledge of that in the above-mentioned letter or other letters. Furthermore, in September 2015, PRN will publicly state that it has no knowledge of the server being wiped. Furthermore, when the FBI picks up Clinton’s server from a data center in New Jersey on August 12, 2015, they only pick up one server. But actually there are two servers there, both being managed by PRN, and Clinton’s emails had been transferred from the old one to the new one. The FBI will discover this on their own and pick up the newer server as well on October 3, 2015, so it seems probable that PRN is not honest with the Congressional committee about this basic fact either. Additionally, when Johnson’s committee asks to interview PRN employees one month later, the company will refuse and will cease cooperating with Congressional investigators. August 8, 2015: The former director of the US government’s Information Security Oversight Office says he is dismayed by Clinton’s exclusive use of a private email account while she was secretary of state. August 11, 2015: One Clinton investigation has expanded to investigate Clinton’s top aides. The State Department inspector general’s office says it is reviewing the use of “personal communications hardware and software” by Clinton’s former top aides, after requests from Congress. In March 2015, three Republican Senate committee chairs—Richard Burr, Ron Johnson, and Bob Corker—requested an audit of some of her aides’ personal emails. August 20, 2015: A federal judge asserts that Clinton violated government policy by storing government emails on her private server. 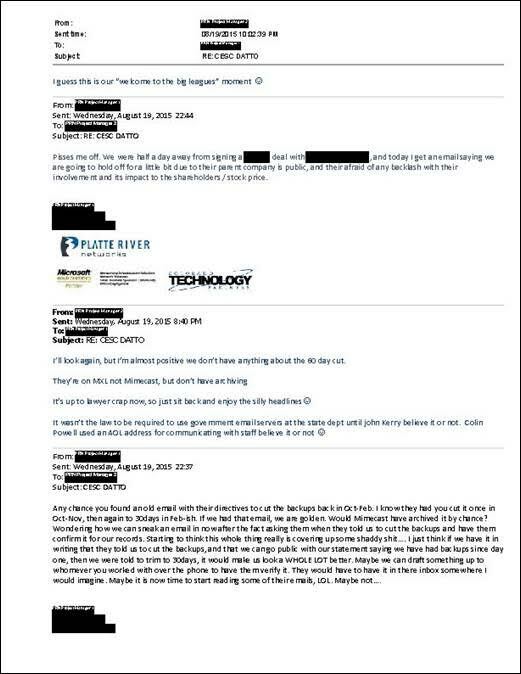 August 21, 2015: An email reveals that every employee of the company managing Clinton’s private server can access the server through the Internet. August 22, 2015: Clinton’s campaign spokesperson privately urges Clinton give a blanket denial that she ever sent classified information through her private server because anything less could open her to charges that she broke the law.